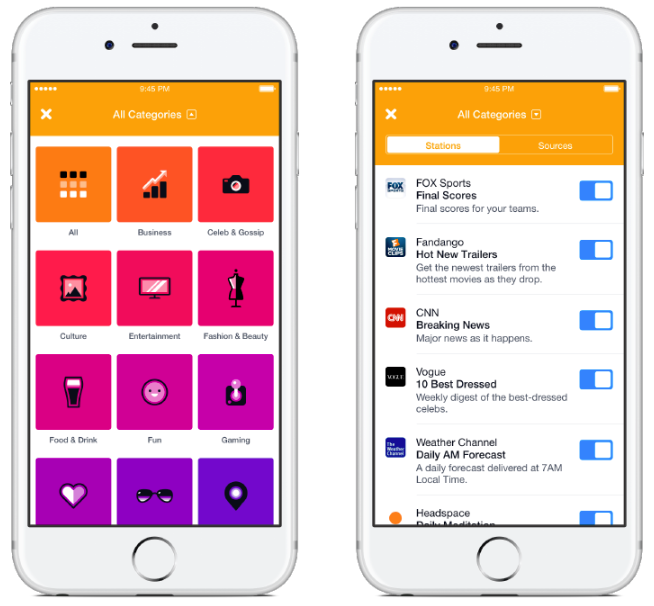 Facebook is expanding its mobile app lineup with a new app called Notify. Notify aims to keep users up to date with the news that matters most to them by delivering timely notifications based on the user’s interests. After downloading the app, users must select a set of “stations” that they would like to receive notifications from. These stations span a variety of categories, from sport game roundups to the latest fashion news. Plus, Notify provides station suggestions based on a user’s Facebook profile. Each station’s source then publishes notifications when there are relevant updates. At launch, the app’s list of sources include numerous big-name brands, such as A&E, Buzzfeed, Comedy Central, Eater, Fortune and more. After customizing their stations, users will receive notifications on their lock screen to keep them connected to the things they care about all day long. To see more than the update, users simply need to swipe or tap through any Notify notification to open the content’s link in the app’s browser. Then users can read the full article, watch the video or view the site. It is also important to note that users can swipe notifications to save them for later reading. Moreover, Notify provides users with a convenient in-app feed with the collection of notifications from the last 24 hours. As long as users don’t get overwhelmed by the app’s notifications, Notify could be a win-win for consumers and businesses alike. While consumers will be able to get quick and timely alerts about the news they care about, businesses can also request to be a Notify source, which gives them another channel to connect with prospects on the devices they use the most. The app is currently available in the U.S. for iPhone users.